3. Business Clients: Our product, iMediChart can dramatically improve your bottom line and boost your customer satisfaction. Whether you are an Employer, or head of an HR department, or an executive at a Healthcare facility, or a part of a management team at a Health Insurance company, we can help you reduce your direct medical expenses significantly. Please fill in the below form to request information on how we can reduce your cost and boost your customer/employee satisfaction. 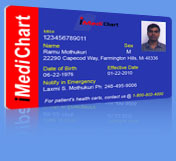 Or please call one of our friendly Sales Executives at 248.918.4685 to discuss more about iMediChart. 4. Fund Raising: Schools and other Non-profit organizations are constantly looking for creative ways to raise funds for some noble causes. iMediChart has exactly the kind of service that can help deliver that in a fast and efficient way. You can let the parents or patrons who would like to support your organization know about the usefulness of iMediChart to help save lives or reduce medical mistakes in case of emergencies (ICE). Some of the effective ways we found so far are through PTO communications, newsletters, bulletin boards, and word of mouth. Every person or family that signs up for our service and provides your school or Non-profit organization name in the promo field during the registration, you will receive 10% of the total yearly subscription fee for your fund raising. It is a great new way to generate that much needed cash for your worthy cause. Please give us a call at: 248.918.4685 to discuss about the enormous potential this has for your organization. *Message: Please fill in your details and an iMediChart representative will contact you within one business day.